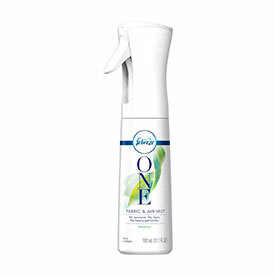 FEBREZE ONE has the same odor elimination power of other Febreze products with a unique two-in-one formula that makes it perfect for removing odors from both air and fabric and has no aerosols, no dyes, and no heavy perfumes for a light fresh scent. By leveraging Flairosol sprayer technology, Febreze ONE produces an ultra-fine mist without the use of aerosols and comes in a refillable package. Duncan Hines is creating a baking revolution by giving consumers the ability to enjoy a freshly baked, individually-sized treat in one minute at any time of the day. 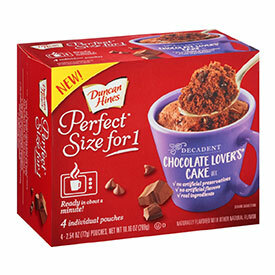 Perfect Size for 1™ offers 27 delicious cake varieties to choose from that only require adding water and cooking in the microwave. To put more fun into your cake, try out Duncan Hines new ready to serve frostings and drizzles that come in 9 different flavors! These mug cakes have no added artificial preservatives or artificial flavors, and the breakfast varieties have 18 grams of whole grains. And there’s no cleanup needed! Ultimate Repair Anti-Damage Mask: Strong, healthy hair is beautiful hair. Expertly developed with patented Hair-Identical Keratin technology, Gliss® Ultimate Repair Anti-Damage Mask dramatically repairs in only one minute. 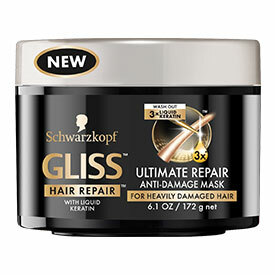 Regardless of the source of damage, Gliss® Ultimate Repair Anti-Damage Mask allows your best hair to shine. 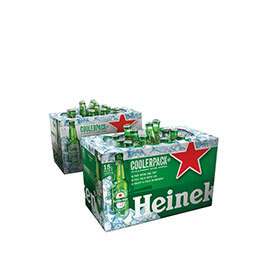 The “COOLERPACK,” an engineered 18-pack cardboard packaging innovation that allows consumers to chill their Heineken® by simply removing the top to their case, and adding ice, is the latest to the Heineken® range of packaging configurations, and brings a cool, convenient option to shelves, parties and outdoor occasions everywhere. ALDI-exclusive Elevation by Millville High Protein Bars live up to their name by containing 20 grams of protein and 13 vitamins and minerals in each bar! 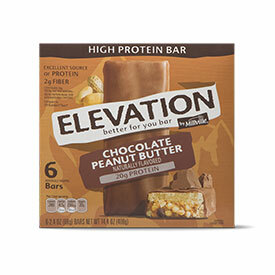 Elevation by Millville High Protein Bars come in Mint Chocolate and Chocolate Peanut Butter flavors. 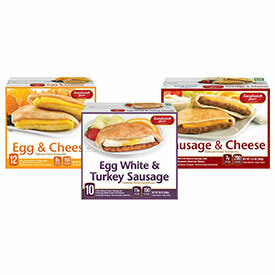 Sandwich Bros. really…really tasty breakfast sandwiches start with all-natural flatbread pockets. They’re baked fresh each day and filled with real, good stuff like JONES® all-natural turkey sausage on top of a fluffy egg white & Cheddar omelet. The Sandwich Bros. believe in the goodness of real, simple ingredients and partner with local Wisconsin companies to handcraft really…really tasty protein-packed sandwiches. Perfectly portioned, only 150 calories and hot and ready in less than a minute. Enjoy America’s favorite cookie in a new, delicious way. 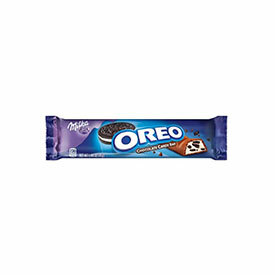 Introducing new OREO Chocolate Candy Bars — It’s the only chocolate candy filled with real OREO cookies and cream. Experience a delectable combination of rich, creamy, melt-in-your-mouth chocolate on the outside, combined with delicious, crunchy real OREO cookie pieces and smooth cream on the inside — to give you a delicious & fun experience that is uniquely OREO. They’re perfect to enjoy anytime, anywhere! In Oct. 2017, Valvoline™ introduced its newest motor oil packaging design – the Easy Pour Bottle. 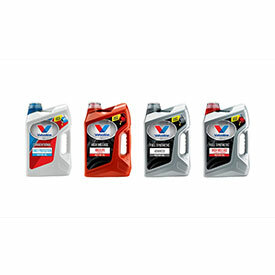 One of the biggest packaging innovations in the brand’s history, Valvoline worked with consumers to develop the game-changing, patent-pending Easy Pour Bottle to make changing oil easier while offering a simplified shopping solution. 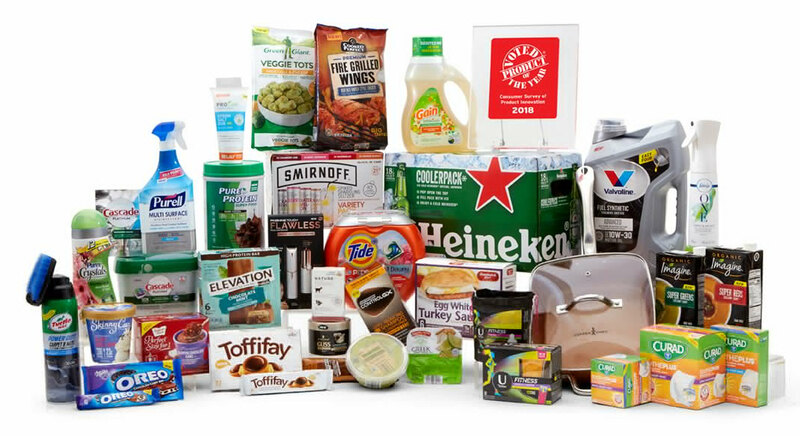 Highlights include an Easy Pull TabTM, Precision Pour SpoutTM, Anti Glug TubeTM, Resealable Overcap with No-Slip GripTM, and a Centralized Handle. Valvoline tested multiple versions to ensure the brand was launching a bottle that would truly meet – and exceed – consumers’ needs. 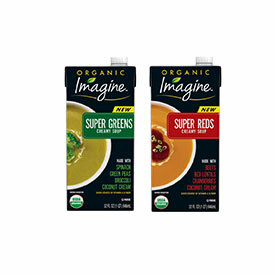 Imagine’s Super Soups focus on power packed ingredients like organic farm-fresh broccoli, spinach, and green peas simmered in coconut cream with a splash of ginger and farm-fresh beets, sweet potatoes, and hearty red lentils with a splash of pomegranate juice to provide a good source of fiber and Vitamin A. This powerhouse combo of beans, vegetables and body boosting plants delivers good nutrition in a delicious, creamy soup. 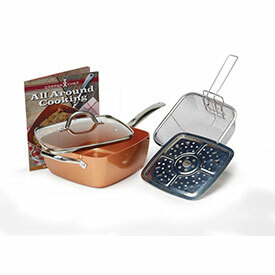 The Copper Chef square pan replaces your stock pot, rice cooker, frying pan, steamer, fryer, wok, and roasting pan. The innovative square shape design creates 25% more cooking space as opposed to the same size round pan so you have extra room to cook more food. Plus Copper Chef features a Cerami-Tech Non-Stick coating so nothing sticks to the pan. Cook healthier without added butter or oil for less fat, calories, and cholesterol. A built-in, stainless steel induction plate ensures rapid, even heating and 850° heat resistance takes the pan from any stovetop— including induction— and straight into the oven. It’s right for all cooks! 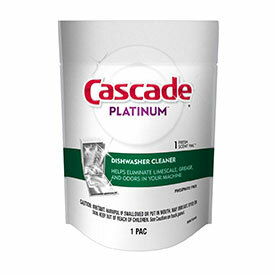 NEW Cascade Platinum is so tough it even cleans burnt-on food. No pre-wash needed. Your favorite Platinum formula has been reinvented with 33% more cleaning ingredients to break down even burnt-on food that others can’t remove. Plus, the new formula delivers Cascade’s Best Shine Ever. 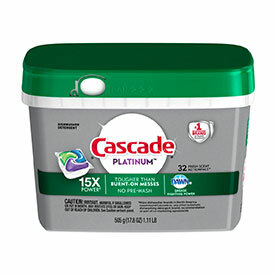 So skip the pre-wash, and trust NEW Cascade Platinum to do the dirty work! U by Kotex® FITNESS products are designed to stay in place, so you can keep moving. They include: Compact Tampons with a FITPAK case to protect your protection on the go. Liners with DualFlex Zones to keep protection where you need it. Ultra Thin Pads with a unique design shaped to fit and flex with your body. As part of their ongoing commitment to bring innovation to the first aid aisle, CURAD® has developed CURAD® SoothePlus™, its latest breakthrough retail offering. 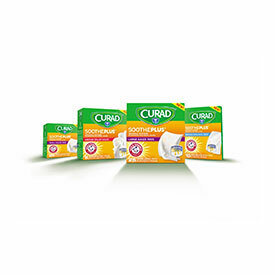 CURAD SoothePlus Gauze and Pads feature the benefits of ARM & HAMMER™ Baking Soda which is naturally soothing and also helps to eliminate bacterial odors. SoothePLUS goes beyond basic wound care to provide an extra level of care that is particularly helpful for large, troublesome, chronic and difficult to bandage wounds. The SoothePLUS™ line consists of the four most commonly used wound care items including: two different sized gauze pads, non-stick pads, and rolled gauze. 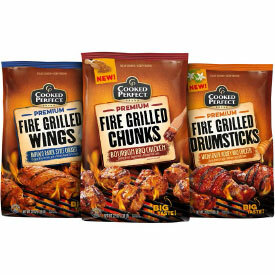 Cooked Perfect Fire Grilled Chicken is heating up the freezer aisle with unique Fire Grilled flavors. Each piece of chicken is grilled over an open fire to produce juicy, tender, perfectly seasoned and mouthwateringly delicious chicken. Cooked Perfect Fire Grilled Chicken’s broad range of chicken tenders, wings, thighs and chunks offers convenience and simple versatility that makes it a great for many situations: as an appetizing entrée, a protein-packed plus-up to salad, a game day snack and more. It’s time to add more veggies. 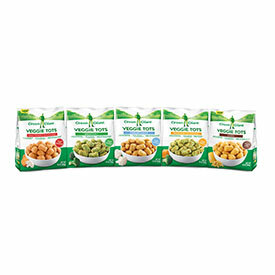 Green Giant® Veggie Tots are the family-friendly way to add an additional serving of vegetables to a meal. They’re filled with veggies, making them the perfect replacement for potato tots and fries. Varieties include: Cauliflower, Broccoli, Broccoli & Cheese, Cauliflower & Sweet Potato and Corn. 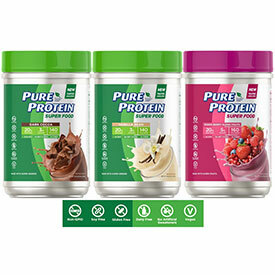 Pure Protein Super Food adds more protein and greens to your daily routine. Each serving contains 140-160 calories, 3g-5g of sugar, and 20g of 100% plant-based complete protein providing all essential amino acids for lean muscle and strength. The delicious non-GMO formula contains naturally sourced super greens, no soy or dairy, and is free of artificial flavors, colors, and sweeteners to keep your active life on track. Super Food. Super You. Super Delish. The brand you trust to sanitize your hands now disinfects the surfaces you touch. 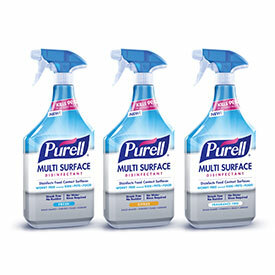 New PURELL® Multi Surface Disinfectant kills 99.99% of germs and is worry-free to use around kids, pets, and food. The alcohol-based formula disinfects food prep surfaces with no rinsing required. Awarded the EPA’s Design for the Environment certification, PURELL Multi Surface Disinfectant contains no bleach and leaves no harsh chemical residue, streaks, or fumes. PURELL Multi Surface spray disinfects and cleans a variety of surfaces including sealed granite, stainless, plastic, glass, soft surfaces and more. 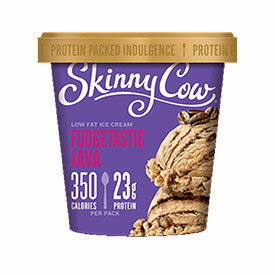 For over 20 years, Skinny Cow has been redefining indulgence, pioneering the idea that you don’t have to sacrifice the things you love to feel good about what you eat. So we’ve introduced four flavors of our NEW Protein Packed Low Fat Ice Cream: The same mouthwatering taste you expect from us, with ingredients you can feel good about all under 400 calories and over 20 grams of protein per package to leave you feeling satisfied. Three exciting NEW Protein Packed Ice Cream flavors launching in 2018 – Chocolate Cake Me Away, Peanut Butter Loves Chocolate, and Rock On! Rocky Road. 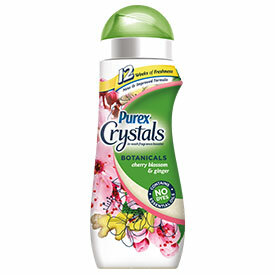 Purex® Crystals™ Botanicals breathes new life into your laundry with a rejuvenating blend of essential oils and minerals. Warm, floral notes swirl with the scents of sweet earth to soothe and calm with a dye-free freshness that lasts up to twelve weeks. NEW Cherry Blossom & Ginger brings the finishing touch on your laundry with a blend of nurturing freshness of nature’s aromas. 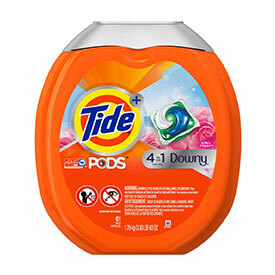 Tide PODS Plus Downy is our first detergent pac to offer cleaning AND protection from fading and stretching directly in the wash cycle, helping transform the washing machine into a safe place that cleans, conditions and protects the clothing you love. The innovative 3-chamber design enables the addition of our breakthrough conditioning technology with cleaning and freshening ingredients in one convenient, easy-to-use pac. 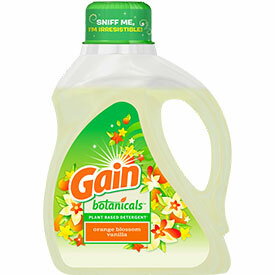 Gain Botanicals provides the amazingly irresistible scent experience consumers know and love from Gain in a 65 percent plant-based formula that is free of dyes, chlorine, phosphates and optical brighteners. Inspired by scents from nature with White Tea & Lavender and Vanilla Orange Blossom, Gain Botanicals now offers a simpler, more responsible detergent with vibrant scent-sations that transports consumers away from the laundry room and directly into nature with every load. Just For Men Control GX is a breakthrough shampoo that gradually reduces gray. The patented technology enables you to effortlessly achieve the subtle, natural look you want simply by shampooing your hair. Use it daily to reduce gray a little bit with each shampoo until you have reached your desired result. Then use it occasionally to maintain the look you like. 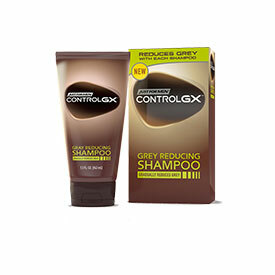 Control GX is so smart, we call it the first shampoo with a brain. 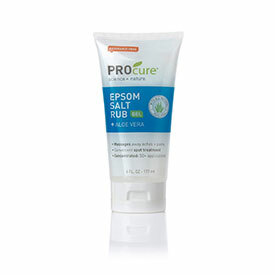 PROcure Epsom Salt Gel is a concentrated gel uniquely formulated with Epsom Salt, Aloe Vera and Essential Oils to soothe muscle tension, aches and pains. Now you can apply powerful Epsom Salt directly to where it hurts most – without the hassle of drawing a bath. 7x more uses vs typical 3lb Epsom Salt bag, this award winning product is great for on the go! Our new Pure Vegetal Base Soap is made with Fresh Canadian Goat Milk, containing moisturizing fatty acids, vitamins A, B3, and minerals. 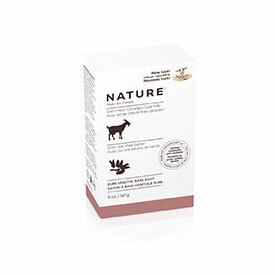 It purifies your skin without affecting its natural moisture barrier. The real Shea butter it contains has nourishing and softening benefits. This biodegradable soap is made with traceable palm oil from a certified sustainable plantation, and produced in a carbon-negative factory. Free of dyes, colorants, EDTA, phosphates and parabens. Not tested on animals. Canus – A Canadian Soap Co. 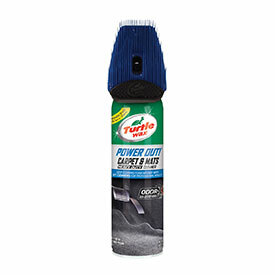 Recent Product of the Year winner, Turtle Wax, introduces the only pet cleaning product designed with a removeable brush cap. The patent-pending MicroScrub Brush is detachable to reach deep into carpet fibers and rubber mat crevices to remove the toughest stains made by your pet. Formulated with exclusive Odor-X™ Technology, this foaming spray destroys odors at the molecular level leaving your carpet clean and fresh. 100% pet safe for inside your home and car. Smirnoff Spiked Sparkling Seltzer stirred up the hard seltzer trend this past summer by introducing the lowest calorie hard seltzer on the market. 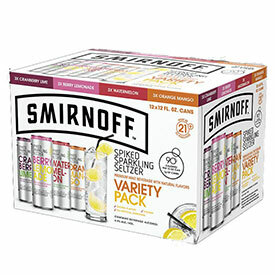 At just 90 calories, zero sugar and just one gram of carbohydrates, Smirnoff™ Spiked Sparkling Seltzer is offered in several crisp, refreshing tasting flavors including Cranberry Lime, Watermelon and Berry Lemonade. Smirnoff Spiked Sparkling Seltzer is expected to unveil an exciting new flavor in the coming months, as the brand continues to push the boundaries on hard seltzers and innovate to satisfy consumers’ ever evolving taste buds. 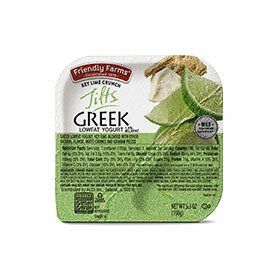 ALDI-exclusive Friendly Farms Greek Yogurt Tilts contain lowfat greek yogurt and delectable toppings that can be combined with just a tilt! The Crazy for Coconut flavor contains a coconut blend with almond and chocolate chip topping. The Key Lime Crunch flavor contains a key lime blend with white chocolate chunks and graham cracker pieces. ALDI-exclusive Little Salad Bar Assorted Fresh Guacamole comes in three flavors: Chunky, Southwest and Pineapple Poblano. 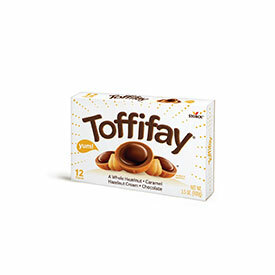 Toffifay® is a bite sized treat sure to bring a little excitement and satisfaction to your every day! Toffifay® is made up of a chewy caramel cup, a whole roasted hazelnut, chocolate hazelnut cream, and a drop of smooth chocolate. Currently available in two pack sizes – a 4 piece pack, perfect for a quick sweet fix, and a 12 piece pack, ideal for stashing and satisfying cravings. With Toffifay, you’re always in good company! Flawless – Instant and Painless Facial Hair Remover by Finishing Touch is the revolutionary new beauty device that erases hair instantly and painlessly without the irritation that comes with plucking, waxing or depilatories. 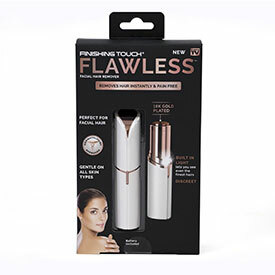 Flawless is discreet, designed to look like a lipstick, and contains the finest German engineered technology that microscopically removes hair. Featuring an 18K gold-plated head, Flawless is hypoallergenic and gentle on all skin types.